If you have chosen any mammal other than Sphynx cat or a naked mole rat for a pet, you're going to have pet fur in your home and on your clothes. You can usually identify a pet lover and the color of their pet by the hair clinging to their clothes. The first step in reducing pet hair on clothes is preventing excessive shedding from your pet. There is plenty of information available on how to prevent shedding from cats and dogs. You can also select breeds that are less prone to shedding. Reduce static cling on clothes by using an anti-static spray like Static Guard on clothes to help loosen hair and make it easier to remove with a brush or lint roller. Place the fur-covered item in a clothes dryer on a low heat cycle like Permanent Press with a couple of wet microfiber cloths (the hair will stick to the microfiber cloths) and tumble until slightly damp. Remove the clothes from the dryer and use a clothes brush or sticky lint roller to remove the remaining fur. If you have woolen clothes that are covered with fur, use a clothes steamer or hang them in a steamy bathroom before using the clothes brush. The dampness will help the fibers relax and release the pet hair making it easier to brush away. A sticky clothes roller is often best for removing pet hair. If you don't have one (or can't find it), use some sturdy packing tape wrapped around your hand with the sticky side out. If you don't have a lint roller or clothes brush, look under your kitchen sink for some dishwashing gloves. If you lightly dampen them and rub them over your clothes, the static they create and the texture of the palms will cause the stray hairs to cling to the gloves. Once they become covered with hair, give them a rinse and start again. 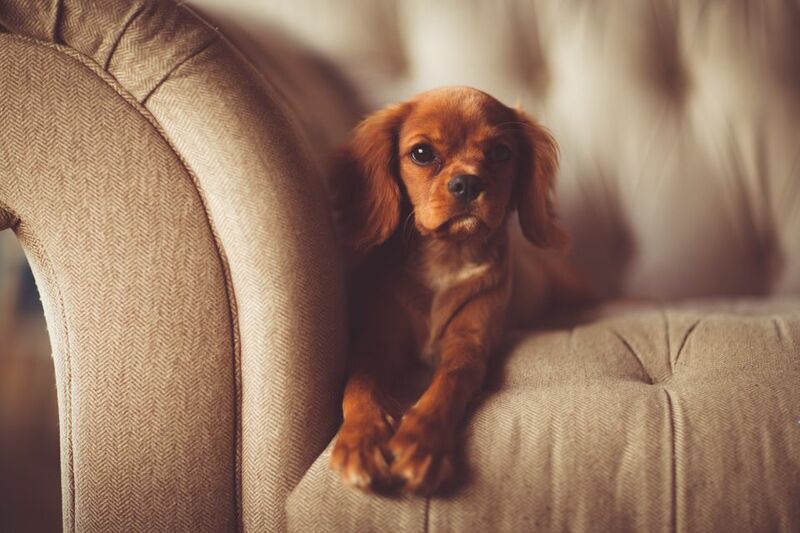 For pet hair on upholstery, start by vacuuming with the upholstery tool on your vacuum. Empty the vacuum cup or bag often to allow the vacuum to maintain as much suction as possible. Next, spray the fabric with an anti-static spray. Brush the upholstery with a microfiber cloth, cellulose sponge, or rubber-edged squeegee. Finally, vacuum again and finish up with a sticky lint roller. One of the best sticky rollers for upholstery is the Evercare Mega Pet Floor Roller. It is 10-inches wide and has an adjustable handle that reaches up to 42-inches making it great for reaching every corner and the backs of upholstered furniture. Vacuum your home and upholstered furniture often. Much of the pet hair on your clothes come from the furniture. Wash pet bedding often. After laundering, run an extra rinse cycle to be sure that your washer is free from pet hair. Check the washer after washing the bedding. If you see any pet hair in the drum, run a cleaning cycle to help flush it all away so it won't stick to the next load of laundry. If you dry the pet bedding in a dryer, clean the lint filter in mid-cycle so that it can collect additional hair as the bedding finishes drying. If you don't clean a clogged filter, pet hair can redeposit on clothes. Add one-half cup white distilled vinegar to the rinse cycle when washing loads with lots of pet hair. The vinegar will help the fabric fibers relax and "release" the hair. When washing clothes, do not overcrowd the washer. The clothes need room to move freely in the water so that the hair can be loosened and flushed away down the drain. Tossing the clothes in the dryer, even for a short time, will help remove hair more than air drying clothes. The use of a liquid fabric softener in the final rinse or a dryer sheet in the dryer will coat the fibers of clothes, reduce static, and help prevent pet hair cling.